A number of tech blogs have shared a video from Chinese website M.I.C. Gadget that claims to provide the first real look at Apple’s next-generation 4-inch iPhone, but there are some clues to suggest the mystery smartphone may simply be a regular 4.7-inch iPhone 6 or iPhone 6s. First and foremost, the distance between the speaker grille, pentalobe screws, Lightning connector, headphone jack and microphones appears to be the same as the iPhone 6s. If this were truly the so-called “iPhone 6c,” those components would need to be closer together on the bottom of the smartphone. The display width also appears to resemble an iPhone 6s compared to the size of the home button, but exact measurements are hard to determine without an object for scale. 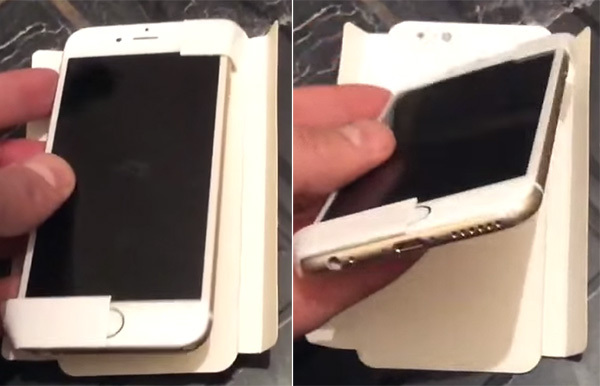 The lack of a 4.7-inch iPhone 6s and 5.5-inch iPhone 6s Plus for comparison also makes the video more questionable. M.I.C. Gadget has accurately leaked some iPhone, iPad and iPod touch components in the past, so there remains a slim possibility this video truly depicts a new 4-inch iPhone. The website has also aggregated a number of false leaks and rumors, however, so the authenticity of this video remains in doubt. The much-rumored “iPhone 6c” may feature a 64-bit Apple A8 chip, 1GB of RAM, 16GB and 64GB storage sizes, 8-megapixel rear-facing iSight camera, improved FaceTime HD camera with ƒ/2.2 aperture, Apple Pay, Touch ID, VoLTE calling and more. The smartphone could launch by the end of March for around $500. This entry was posted in iRumors and tagged iPhone 6S, iPhone 7, irumors, iRumorsnow. Bookmark the permalink.